The new Stand Up SqueezyStraw™ Dispensing Pouch is the only pouch with a built-in sipping straw feature! Just squeeze the pouch and sip through the straw. 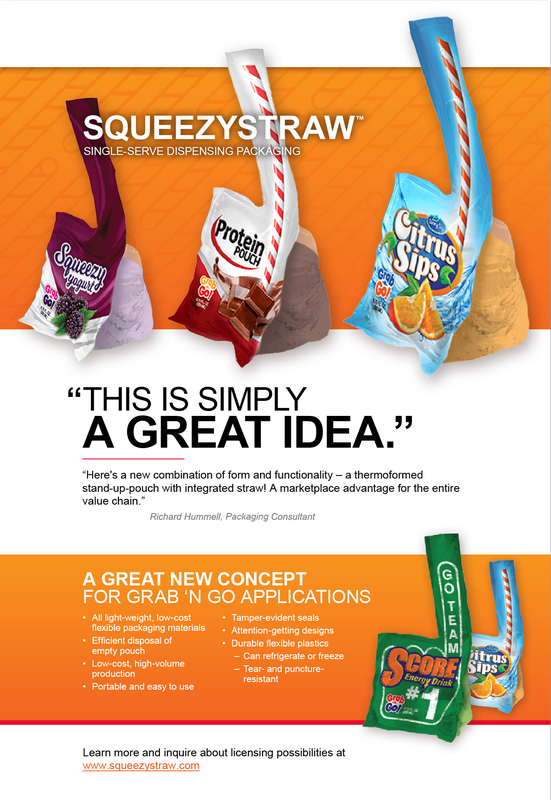 The Stand Up SqueezyStraw™ Dispensing Pouch is a totally new approach to stand-up pouch production. The stability of the package is built into the design, creating a low center-of-gravity. As the user sips from the pouch, the center-of-gravity continues to drop, making the pouch increasingly more stable. To learn more and discuss your interests, use our online contact form or call Company President Lew Barton at 917-647-6388. *SqueezyStraw™ and related technology developed by Barton Group Inc. are protected by U.S. patents 8,430,266; 9,187,225; 9,758,284; 10,059,498; 10,000,325; and 8,381,941.